In 1986, National Security Decision Directive 221 declared drug production and trafficking a threat to the security of the United States. The U.S. government response to the drug (predominantly cocaine) epidemic was multi-faceted, in keeping with the nature of the trafficking threat. 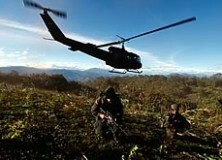 In the source region, the United States urged the Andean countries to gain control of their traffickers, and provided law enforcement and judicial system support to the Andean countries––Bolivia, Colombia, and Peru–– through the Drug Enforcement Agency, the State Department, and other institutions. However, by the end of the decade, it was becoming clear that counterdrug efforts in the Andes were not working. In August 1989, newly inaugurated U.S. President George H.W. Bush launched the Andean Initiative––a five-year program that allied the United States with Andean countries in the fight against narcotics. The initiative provided financial aid, program support, and training for Andean military and law enforcement efforts. The newly-created Office of National Drug Control Policy (ONDCP) and its Director (commonly referred to as the Drug Czar) were charged with coordinating all U.S. domestic and international counterdrug efforts. ONDCP was additionally mandated with power to dictate national strategy and a national drug control budget. Thus, NSD-18 granted the ONDCP integrative and leadership responsibilities for the Andean Initiative. The elevation of Andean counternarcotics to the level of a national security threat meant that the Department of Defense and the Central Intelligence Agency would join the Department of State in the institutional structure. NSD-18 designated the State Department’s Bureau of International Narcotics Matters as lead agency in the development of Andean country programs. Department of Defense (DOD) policy directives and procedures were revised to expand DOD support of U.S. counternarcotics efforts and to permit DOD personnel to conduct training and operational support activities. In addition, the Department of Justice’s Drug Enforcement Agency, U.S. Customs Service, and U.S. Coast Guard provided advising and training for their Andean counterparts. The Agency for International Development and the United States Information Agency were also involved in the initiative. Institutionalization of leadership, proactive crafting of strategy that recognized the multi-jurisdictional range and challenge of the Andean drug problem, and reconfiguration and integration of government security institutions constituted the primary strengths of the U.S. approach. Emphasis on collaboration in the strategy, initially configured by National Security Directive 18 and the first National Drug Control Strategy of 1989, helped bridge agency disjuncts. The president’s declaration of the primacy of the drug threat also provided a fulcrum to motivate action. However, several critics have concluded the Drug Czar lacked real authority to enforce decisions. Notably, the czar did not command nation-wide drug policy budget authority and to solve bureaucratic disputes the czar remained dependent on presidential backing. The monitoring of military aid in achieving counternarcotics objectives was also particularly problematic. Assessments of the Andean Initiative, and indeed of counterdrug strategy in general, do not provide a universal picture of success. Such measurable objectives as the number of hectares of coca destroyed or the amount of drugs seized were touted as a desirable means of evaluating success or failure, but difficulty in gathering reliable statistics on these drug trade measures makes them uncertain assessors. Still, the U.S. counternarcotics infrastructure was strengthened through the Andean Initiative. Almost immediately, coca crops were reduced. The Medellin cartel was effectively dismantled by the time Bush Sr. left office, and the Cali cartel followed in a few years. Gradually, the Andean countries were strengthened in their ability to fight cartels, combat insurgents, and improve governance. The counterdrug alliance between the United States and these countries was also solidified. Analysis of the Andean Initiative provides an example of how the U.S. government attempted to integrate multiple tools of national power across disparate jurisdictions in pursuit of one primary strategic goal: namely, decreasing drug production and trafficking in Bolivia, Colombia, and Peru. While complete success in the so-called War on Drugs is elusive and hard to measure, tangible results were achieved in the Andean countries to the long-term benefit of U.S. national security. These gains were accomplished through an interagency approach that focused on justice and law enforcement but which also leveraged DOD assets in a way that avoided pulling the military into large-scale operations.